This is a very lovely set. It's not too pink or purple its just right. and its not over whelming. My only complaint is that for the price it wrinkles terribly. The last thing a very pregnant woman or new mom wants to do is iron bedding. IF you want it to look NICE, you MUST IRON the crib skirt and gently steam the border unless you put the border on right out of the dryer. Neither of the bedding I purchased for my boys which was half the price needed to be ironed. EVER. Overall I wouldn't change anything. This butterfly themed nine piece baby bedding set was created by Sweet Jojo Designs. 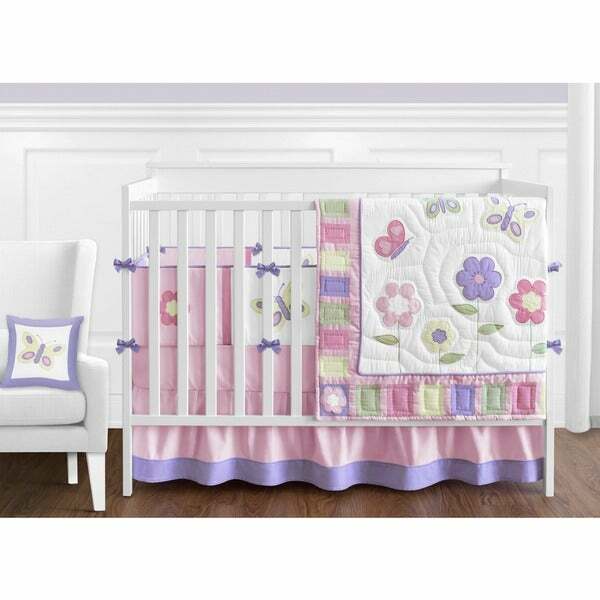 This set includes a blanket, crib bumper, crib skirt, fitted sheet, toy bag, decorative throw pillow, diaper stacker, and two window valances. "Can you purchase an additional valance?" Hello lyfrye, I'm sorry we do not have the valence for sale. If you google sweet jo jo design butterfly valence they should pop up for different stores. Have a great day!